Since the girls have been successfully counting from 1 to 10 for a while now, I decided to tackle the alphabet next. Just like when learning numbers, what works best for us is making this fun and part of everyday life. 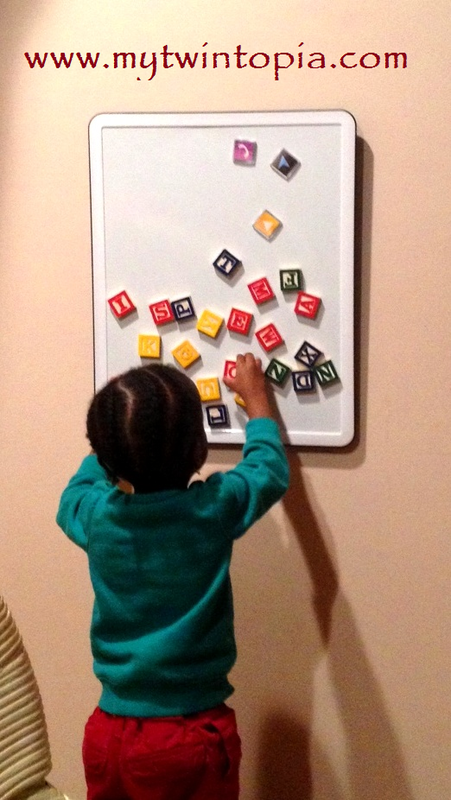 Here's a short list of tools / educational toys that have really helped the girls learn their letters. This mama's heart just about burst with pride. My last potty training update was Tuesday of the first week. What has happened since then? Had a couple of accidents in that first one week and quickly figured out that going to potty is the solution. Both in school and at home she will say "potty" when she wants to go. She successfully went for the whole of last week without an accident. * Home arrangement: Creating a clear path between wherever the girls were and the toilet. The gates stayed open and the lights in the toilet stayed on. This way, when they realise they want to go, they can dash down before an accident occurs. I think this was instrumental in making Sugar very independent with the going to potty business. There's a school of thought that believes that pull-ups slow down the potty training process. I haven't observed that with Sugar as regardless of if she's wearing pullups or cotton underwear, she'll go to the potty. This is the week where we break the tabs on the first of our size 3T clothes. Sugar in pic above checked out all the labels on the clothes and then ripped them all off and threw in the trash. Spice in pic below put on her "Princess Ariel" costume and checked out the fit of the clothes just as she's seen mommy do. The girls and I spent Saturday morning checking out which 3Tclothes would fit and which ones were still too big; plus weeding out the too short 2T clothes. 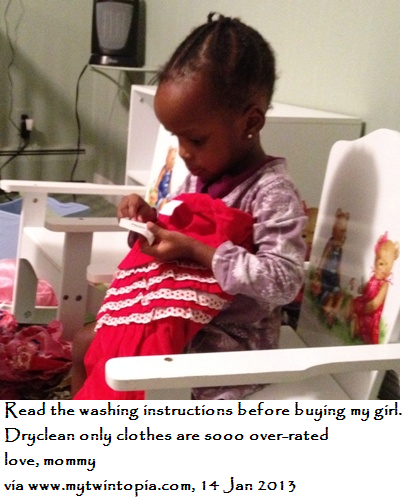 It was a lot of fun for me and made me realize that the girls had too many size 2T clothes. I'm currently stocking their 4T clothes box and will definitely be focusing more on quality than quantity now that the clothes are supposed to last a year. These photos are for week 2 of my Project 52 for 2013. My goal is to take at least one picture every week and write a note to the girls on it. Some weeks will have pictures of the girls together and some weeks will be individual pictures of each girl. 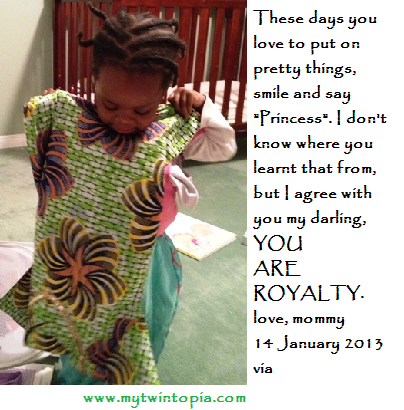 * Samantha of Cherry Pie Twins is also doing a weekly photo project to document life with her precious 2 year old twins. It's worth checking out. If you're doing a similar project this year, do let me know and I'll put your link in my weekly posts. A boppy pillow was one of those items a lot of moms raved about and I had on my wishlist while pregnant with the twins. Since I already had a brand new twin breastfeeding pillow, I decided to buy a used boppy pillow from one of my colleagues. H was selling it for $10 and for an additional $5 he offered to throw in a digital baby scale. For 5 bucks, I got my most under-appreciated baby item - the Redmon Weight to Grow digital baby scale. Apart from when we were in transition and our things were in storage, I've used this scale every month to monitor the girls' growth. I've found the scale to be very accurate and it gives their weigh to the nearest half ounce i.e it gives weight readings like 24lbs 9.5oz. Does every baby need to be measured monthly? No. Do twins need to be measured monthly? Probably not. How does having a digital weight scale help me? It makes it easier to track the effect of dietary changes on their growth. After their second birthday, I switched the girls away from their 3.25% fat milk with a scoop of toddler formula. Instead they now get 2% lactaid milk which is a lot less calories than they used to get. Sugar is on the 10th percentile line and does not need to be dropping calories. I assume that eating more solids would make up for the reduced calorie intake and growth will not be impacted. . If their growth is impacted, my digital scale will be the first signal that something is wrong. I was going to give this scale away until I discovered it goes up to 44lbs. Now I plan on keeping it. There are many babyscales around but the Redmon Weight to grow is the only one I've used and I can recommend it to any parent who has reason to want to keep an eye on their kids' weight. In 2+ years I haven't had to chance a battery. Brand new, it's fairly pricey - around $75 in various online stores so if a colleague ever comes to the office and offers to sell you one, take him up on the offer. * The girls wore pull-ups to daycare AND Spice made a peepee in the toilet one time. I celebrate all progress. * Spice woke up DRY! I'm trying not to hyperventilate in excitement here. I'll still have her sleep in diapers a few more nights but maybe by this weekend, we'll try napping in big girl undies. * Tuesday evening was a repeat of the morning. I patiently confined all 3 of us to the bathroom and after the better part of an hour, Spice peed in the potty. Sugar was determined to hold it until bedtime when she got a diaper. * A very attentive mommy. Catching those first trickles and helping them make the connection between the "gotta-go" feeling and sitting on the potty is the objective for now. This means when I sit in the hallway patiently waiting for the pee to come, no phone distractions. * Understanding that this process can be very scary and emotional for the twins and being ready to address that. The way Mandy handled her daughter's emotions during the potty training process has always stuck with me since I read her post over a year ago. I confess that if I hadn't read that post, I may not have been so patient in handling Spice's fear of sitting on the potty. I've also had to deal with Sugar being extra clingy especially when she's trying to hold her pee in. I read and reviewed the Motherstyles book a while back and strongly recommend it for everyone. One thing about parenting in an over-informed era is that there are so many schools for everything. I chose this slow, sequential style of potty training because that's what goes most with my personal style of doing things. With reading the Motherstyles book, I also learnt that I would need to work hard to "get" some of the emotional stages that kids will go through. That knowledge is what makes me follow moms like Mandy who have very obvious strengths when it come to understanding kiddie emotions. And believe me, potty training is a VERY emotional time for both the trainers and the trainee. I'll like to take this moment to say thank you to all the fabulous Mom bloggers who keep it real on their blog and provide a learning resource for the rest of us. To be continued next week? next month? Sometime! So I've survived my first weekend of potty training twins (Mr Jack Daniels was not so lucky) and here's the report card on what I'm hopeful will be a very short and successful process. Two pottys (1 Baby Bjorn and 1 Arm & Hammer) in the girl's bathroom. Eliminating ALL distractions. I finally got to this point after dinner. I knew they would want to pee, so I confined all three of us to the bathroom and adjourning hallway. All other doors were closed and toys put away. Their only option was to run in and out of the bathroom. I didn't insist they sit on the potty, I just sat on the floor and waited. The girls were wearing only teeshirts - naked from waist down. Soon, I saw Sugar dashing to her potty just as the first trickles started. She made her first peepee in the potty *insert clapping, hooping and hollering*. I was quite proud and she felt quite good with herself as well. Her reward was that she got to wear her "monkey" underwear and a hat and go into the parlour to watch TV. Spice asked for the same perks but I told her I needed some pee in the pot first. Day 1 started out looking like a fail but ended up much better than I expected. I started this journey planning to only potty train Spice because I thought Sugar wasn't emotionally or mentally ready. I'm glad to be wrong. Day 2 report to come tomorrow. It's finally time to bite the bullet and start actively potty training the twins. The process has been a while in the making and now I think we're ready to take the plunge as all the preparation steps have been taken. What steps? Buy 2 potty seats. We own 1 Baby Bjorn , 1 Arm & Hammer and 2 Bambino Mio pottys - 2 pottys for each level of the house. My favorite is the Baby Bjorn and I would recommend that for younger toddlers like mine. It's important to have at least 1 potty per child. If I had to do it again, I wouldn't go with the rule of having potty stations on each level of the house because we spend most of our active waking hours on one level. 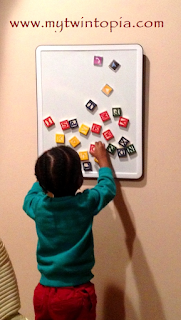 * MandyE's potty training process for her twins which was paced over a few months. I'm definitely adopting a slower-paced style of potty training that eases the girls and I into the "new regime"
* Julia's use of the 3 day method with her twin girls. I love her tips of tackling day and night potty training at the same time. May try it. * Diaper-Free Before 3 - The first and only book I've read on potty training. I agree with the author's style of not making a big deal out of what is basically another bodily function and it's helped shape my approach. When do you start feeding solids in addition to formula? When babies are still hungry but their bellies can't seem to take any more milk. That's what I noticed with my twins and we reached this point when they were around 5 months old, weighing 15 lbs and getting 30 ounces a day. Is sterilization important? Definitely in the first few months especially for twins who are born early. I stopped being particular about sterilizing things when the girls started crawling and stuffing unspeakable non-food things into their own mouths (around 9 months). Which formula is sterile? Ready-to-feed formula is the only one guaranteed to be sterile by the manufacturer. This is what I fed the girls (along with breastmilk) for the first 6 weeks. After that I switched to powdered formula mixed with distilled water (Pediatrician recommended distilled water over normal bottled water. $1 for a gallon jug from almost all grocery outlets). How are the brands different? All formula sold in the US meets the minimum requirements set out by the FDA. The differences come in the products that were used to meet that minimum nutritional requirement. Recommended brands? All parents have their go-to brands. For me, I used Similac ready to feed for the first 6 weeks because it came in plastic containers and enfamil came in cans and I'm not a fan of canned foods. When it was time to switch to powder, I noticed that similac produced a lot more gas than enfamil powder - yes I prepared 2 bottles of each formula, shook hard and timed how long it took for the gas bubbles to disappear from the top! Is formula as good as breastmilk? Ah that million dollar, passion-inducing question. My simple answer; feed the kid. The end! Make "greener" lifestyle choices. Calgary has a wealth of organic food options and I intend to explore them fully. Last time I was in the grocery store arguing with my self over the cost of organic foods, the sarcastic little voice inside me whispered "it's cheaper than chemo!" These are more life action plan than resolutions. They are also things that I look forward to doing. I'd love for you to share your plans for the year. I'm looking for one or two blogging year-plans to participate in.